You think we come from some fairy story? You think we trip down the pages? You think we trip down the pages, as if they were steps from one of your fantasy castles? I assure you, we are there. But that is not where we come from. You think we are the stories? But the stories! you say. You think we are the stories? Oh, of course, we are in your stories. But that is not where we come from. You think we are the stuff of legend? Are we the stuff of legend? You think we are elements of your myths. We are in your myths and legends. But that is not where we come from. It is easy to blur the borders: we are in a forest made of books, after all. A forest made of stories, legends, myths. You will find us in the shallow forest. You will find us in the shallow forest, to be sure. On the edges, in the stories, in the tales handed down from your grandma and her grandma before her; you will find us there. But that is not where we come from. But what happens in the deeper forest? But what happens in the deeper forest, beyond your simple paths, the house too small to live in but perfectly decorated with the plates set out for tea? What happens when you go so far in that stories begin to tell themselves? Well, we say. Well, then—you are closer. And what’s that behind you? And what’s that behind you? Surely it’s only a shadow. Light filtering through cut paper, light bleeding out from twinkle trees, obscured by a solid object. You tell yourself that’s what shadow is. That’s what shadows do. Isn’t it? You think we are tragic creatures? You think we are tragic creatures? You think we are sad? No, no: we are watching. We are waiting. We are thinking. We are waiting for those words that echo all throughout the forest, all throughout legend and myth and fairy tale. Oh! Here they are. Those words that bring our souls out into the moonlight, that let us give you just enough of us to want more, and more always. And here is the secret. Listen: I will only tell it once. You may revisit it in a hundred stories, but this is the only time you will hear it from my, from our, lips. There is no difference between the copse of trees at the bottom of your garden and the ancient forests you wander when you can. It is only that in those ancient forests we rise wilder, and you can take a journey on foot to a place where you can believe in us. There is no difference between the oldest story ever told and the story that springs into your mind now, fully formed. They are the same, and we are in both of them. All forests are one forest. All forests are one forest. All legends are one legend. Each forest is new. Each story is new. But I did not tell you where we come from, you will say. I have been telling you all along. We come from the breath between the lifting of the pen and the word on the paper. We come from the shoot of green that struggles up through the snow. We come from the deepest forest, the oldest story, and we are as present in the three trees in the schoolyard and the library book as we are, as we ever were, there. Don’t fight it. Come in. I have more stories to tell you. So many more. There are so many things in the book forest that I cannot begin to list them all. But Awenia is open to the public throughout the month of December: Please come and experience it for yourself! That feeling of accomplishment, accompanied by multiple days of hard napping, is what I’m feeling right now. Here are some glimpses of Awenia. Gwyneth handled the wand-waving, but I, The Author, finally took a bit of Awenia and wove it in to my own personal dimension, which, like the rest of Awenia— The Great Awenia Forest and Awenia Faerie— will be open to everyone for the month of December. Haven is a place to hang out with friends, maybe see some pretty things, and a nice quiet spot somewhere in Awenia’s uncharted space just to be. A little pocket Realm, tucked somewhere within Awenia, Haven is a little like a house museum, in that it’s my home, but I’m opening it to people this month. The sparkly glowing dance floor might even have some events going on; I’ll try to post these as and when they happen, and of course if you’re a member of the Awenia Friends group in-world, you’ll receive updates anyway. Awenia is built inside a so-simple-it’s-brilliant skybox from Landscapes Unlimited. It’s called a Mirrorbox. It doesn’t show up all that well in these photographs since they’re mostly of buildings, but as new photos of Awenia are released, you might begin to see what I think is so cool about this skybox. I used too many wonderful things even to begin listing all of them for this post, but at some point I’ll make an inventory for you and codify everything that’s here, at least in Haven. All the buildings are from Trompe Loeill, the big birch trees are from Balderdash, the Illuminated Oak is from Heart (front left) and Rivendale made the lovely Juniper Tree (front centre, green foliage). That covers all the trees you can see in this photo except the swing, which is from Dictatorshop. Here’s a little peek inside my front window; again, too many things to detail them all here, but the porch furniture is from Trompe Loeill, and I did much of this decorating around the time that Apple Fall had that amazing 75% off sale…. yeah. The three islands are linked via these bridges from The Looking Glass, the Dawn’s Promise Bridges that were released at the 2017 Fantasy Faire. The barn holds my personal vanity gallery of my favourite photos and pictures I’ve made since getting serious about SL photography a few years ago. I put the sparkly dance floor together so my favourite tame DJs, DJ Fae and of course Nyza Stillwater, could spin to their hearts’ content. Tiny Gwyneth is there to show you that you don’t fall into the water, even if you do not have wings! Above you can see Gwyneth’s actual tired face! This is how she feels when she’s been dealing with me creating my own little thing in the middle of her Realm. She would like me to let you know that the stunning headdress she is wearing is from Noble Creations. 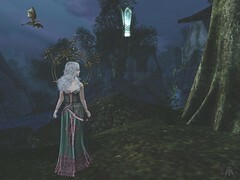 It’s called the Nymph Crown and you can get it at Whimsical, any time before December 18. Don’t forget to visit Awenia. I hope you will like it.